Darn, too slow! This AYA has already gone! A cheap and cheerful Yeoman for use in the field. Very good condition overall, tight on the face, chequering is in good condition. Nice bit of wood on it. Slight pitting at the end of the chambers hence cheap price. 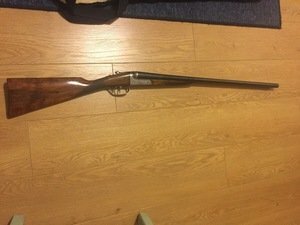 Need to sell as I'm moving house and wont be able to take my guns with me.